Christopher Brookmyre launched his new Jack Parlabane novel “Dead Girl Walking” on January 15th at Sloans Ballroom. I was lucky enough to attend the event, which was organised in conjunction with Waterstones. Book readings are always quite a strange sort of event to attend, I think. Despite the fact that the people doing the reading and promoting are indeed quite well known members of society, it’s an altogether more civilised gathering than going to say, a concert. My dad and I arrived at Sloans, naturally found the wrong floor, and then had to make a somewhat undignified dash up two flights of stairs to attempt to be through the door in time. I’m an English Literature student, and not only that, but a massive lover of all things crime fiction. 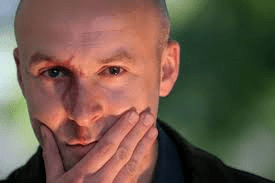 For me, Christopher Brookmyre was my introduction to that sort of fiction- my parents were huge fans when I was younger, and I always remember my mum saying of “A Big Boy Did It and Ran Away”, “that’ll be an excellent book for you to read when you’re older Nicola.” Several years later, aged 15, there I was, crying with laughter on a flight reading it while my parents looked on in delight. It’s also no huge secret that I am a lover of all things Brookmyre- from Parlabane to Sharp to Bedlam, I have loved and devoured them all with equal pleasure. I have been known to follow the poor man the length and breadth of the country to attend his events, following on from a speech he gave at my school when I was in second year, a speech I know to this very day still holds almost legendary status. For me to be able to attend the launch of a novel featuring one of my all-time favourite literary characters, (I voted for Parlabane several times in a recent poll) especially as he had been absent from my life for such a long period of time (a Parlabane novel has not been published since I was 13) was an absolute treat, and Brookmyre sold his new novel to the audience with such conviction that it was clear that everyone in the audience was completely on board. However; for me, the highlight of the evening came from the short story that Brookmyre read, one that had been commissioned for an event he did at the start of the commonwealth games- I won’t spoil it in case anyone else is lucky enough to hear him read it, but it is an absolute classic, full of the usual wit and outrageousness that one has come to expect from Brookmyre. Posted in Arts and tagged christopher brookmyre, crimenovel, deadgirlwalking, novel. Bookmark the permalink.